The man behind the hardest rides in endurance cycling. VeloPro is proud to be training partner for The Cent Cols Challenge. The Cent Cols Challenge is one of the hardest amateur events in the world of cycling. Challengers pit themselves against the mountains of Europe’s great ranges, riding 100 cols in just ten days. Phil Deeker is the mastermind behind these events. He came up with the idea in the year of his 50th birthday so he could do what he loved most – climbing mountains on a bike and sharing his passion with others. VeloPro: Where are you from? Phil: Rather ironically, I grew up in the Surrey Hills of Britain which have now become the weekend destination of choice for so many London cyclists. Coldharbour, Leith Hill, to be precise. I learnt to ride a bike where the only options were to grind UP or fly DOWN. The less control involved in the latter the more thrilling was the fun! I had no idea there was an official sport built around the bicycle! How did you get in to riding? A change of job brought me back to the UK after living in Belgium & France for 20 years. This meant that most of my days were spent behind a desk. For the first time in my life, my days were indoors and inactive. I had become obsessed with my first race-bike when I was 11 years old, and since then had almost always owned a bike, but was always unaware of the sport itself. I just loved riding my bike. 30 years on, the seed found the light: a daily commute on a newly purchased ‘hybrid/city’ bike became my redemption, keeping me both fit and sane! Within five years I was riding a titanium Omega (now Enigma); had ridden most of the Cycle-sportives in the UK, and just as many Audax rides; had ridden my first mountain (Montagne de la Lure in Haute Provence); and had completed my first Etape du Tour (240kms from Limoges to St Flour). But most importantly, in cycling I had found my perfect way to combine a love of nature and sport, with ‘speed sensations’ thrown in as an irresistible bonus! To spend a day indoors and inactive has always felt to me like I just chucked away a precious day in my life. To ride outside from dawn-to-dusk, in untouched nature, with others, brings with it a feeling of thanks and wonder each and every time: “wow, what a gift that day was and YES I’ve made the most of it!” I’m a simple man! How did you come up for the idea of the Cent Cols Challenge? The more I rode in the mountains, the more I realized that this was where I felt most at one with myself, the bike and with others doing the same thing. I had my 50th birthday looming on the horizon and I saw this as a chance to indulge in my new passion, without knowing quite how. A magazine news brief about a French guy who was planning to ride 100 cols in two weeks using routes created by a club called the “Club des Cent Cols” resolved the issue. Thanks to my wife, Claire (who subsequently worked tirelessly on every CCC event for the first six years!) I completed my own version of this, with Claire driving the support car: 300 Cols in 26 days. Naturally I returned to ‘normal’ life with a changed perspective. The idea of creating an event that could provide a chance for others to ‘achieve the impossible’ and to see things differently, and that might pay some of the bills and allow me to ride my bike A LOT was soon born. Thanks to Simon Mottram’s (CEO of a two-year old company in London called Rapha) belief in, and support of, my crazy idea, the first Cent Cols Challenge was held in September 2009. What is it about the mountains that calls to cyclists? I could write pages on this one. Another time. I think it’s something to do with a) setting and achieving a visible (usually!) goal; b) leaving our worldly worries ‘down below’ c) experiencing the power of nature and venturing out of your comfort zone d) bringing back a “trophy” ( a slightly disrespectful way of recalling the experience, in my own mind!) and e) the promise of the thrilling descent once over the top. I could go on! Do you have a single favorite mountain pass to ride? If so, which is it and why? I STILL answer this oft-asked question with: Mont Ventoux. I could also go on for hours on this one! To be brief, I have ridden it well over 50 times and can remember most of those rides individually. Each a new experience. I have a very fond spot for Provence. The Mont Ventoux is it’s King. It is alone. It does not belong to a range of mountains. It provides a perfect example of what climbing a mountain is about: it is broken up into well defined ‘steps’ with a vegetation that changes so noticeably with the elevation. It can be the most hostile place I know of to try and ride a bike. I have respect for this mountain like no other. But in the end, this is just a personal thing. I am not declaring this as The Best. It’s just (my) Best!! 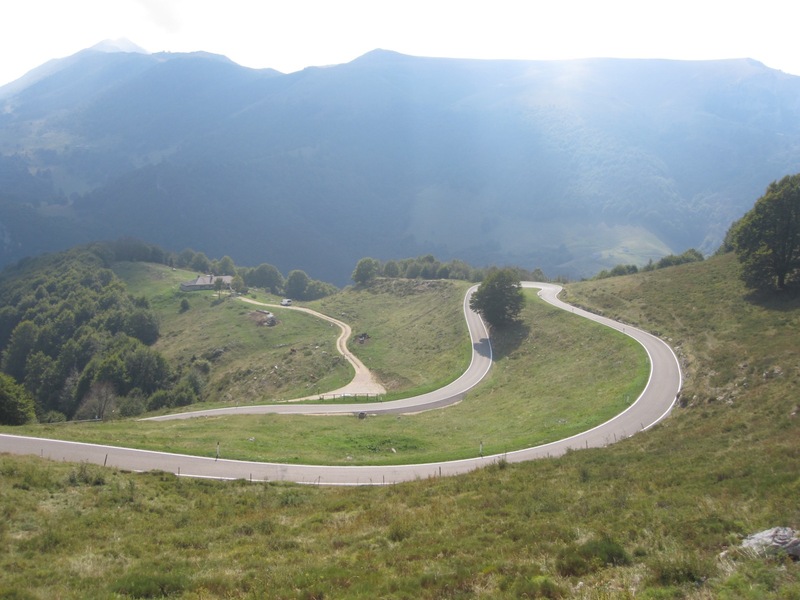 For the Cent Cols Challenge a lot of time is spent preparing for and fearing the climbs. What can you tell us about the descents? Ha, good point. I thought once of announcing the difficulty of each stage by the total down, not the up! This aspect of the Challenge is often under-estimated. Descending is a BIG part of the Challenge. It demands maximum concentration from the riders to stay safe. Road surfaces can vary, adding another aspect to the technicality of some descents. I enjoy teaching riders how to descend efficiently and safely. I used to love and indulge in the thrill of going very fast downhill, but with age (and a few inevitable tumbles) one sees the wisdom of giving oneself a more reasonable safety margin. I try to show riders that the key to really enjoying descending, once they have learnt a simple technique, I show them, is in the FLOW, not the speed. To carve a smooth line, braking only to ‘shape’ this line, not to interrupt it, is fun and safe, not only for oneself, but for other riders behind you. We’ve noticed a “Wall of Fame” on the Cent Cols Challenge website. It seems like a pretty select group of riders for each challenge, what can you tell us about that? This is a privileged place for those riders who ride every kilometre of the route. This ‘completion rate’ can vary between 10 and 80%. Riders often put enormous pressure on themselves to not miss a single col. Then the body says “No, gimme a break!” They give in, and sometimes this can be quite an emotional moment. But they don’t give up. There is no ‘Pass or Fail’ on this event. Such is the mutual respect between riders for just showing up for Stage 1, that even when a rider must take some time in one of our vehicles, he has no feeling of ‘exclusion from an elite’. In fact, almost always, it’s a game-changer moment for the better. Riders can relax, be kinder to themselves and realise that just to be riding ten days in great company in amazing scenery is more than most cyclists ever get to do. That they rode 80, 90 or 100 Cols becomes secondary to most CCC riders. Yes, those who do make all 100 of course have an inner feeling of special achievement, which is rightly recognised by their name on the Wall of Fame. 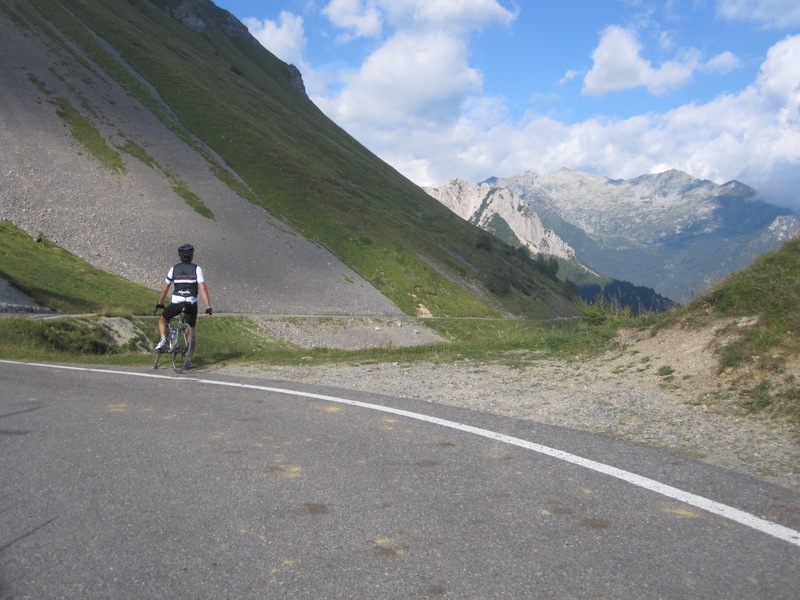 Can you talk a bit about the importance of training for the Cent Cols Challenge? Can someone just show up and ride themselves into fitness? A very solid base of fitness is essential. I have seen some riders quite obviously ‘ride themselves into’ the event, but they are a lucky exception. They cheated on the hours of turbo torture the others put themselves through! The thing is, the days in the saddle are long, so recovery time is short. Think of it as a ten-day ride, only interrupted by 6-7 hours of sleep in between stages. The best way to train for one of these Challenges is to follow a strict training program where you have as many sessions as possible in blocks of back-to-back daily rides (even 1-2 hours) followed by a period of full recovery, which is so important. I have seen some riders arrive at the event still exhausted from their training!! Is there a particular type of athlete who is well suited for the Cent Cols Challenge? Excellent question! Yesterday, out on the bike, I was thinking about the small number of riders I have ridden with over ten years of CCC events who have not come back and who didn’t really enjoy themselves. I concluded that us “CCC Riders” are all Romantics, to a lesser or greater degree. We are not ‘Stat Slaves’, nor are we ‘Winners, not Losers’. You cannot climb over 15,000 ft per day for ten days just looking at your watt output or average speed. It doesn’t make sense. The scenery, the views, the jokes with your co-riders, the sunsets, the sweat and the tears. We don’t press upon each other our own achievements: we’re riding a CCC, that says enough. We know we are doing something special, something we have worked hard to get to, and we recognise our special luck in life to be there. On a more realistic level, of course, endurance is more useful than top-end speed. Which is why 40-50-year olds are often more suited to this than 20-30-year youngsters! There’s always that moment where an athlete bottoms out and feels like they have nothing left to give. How do you help them continue? Have you had riders abandon the challenge? Oh yes, almost all CCC riders come to this crossroad. All cyclists know this feeling of hitting the bottom and wondering where any more energy is going to come from. That’s where camaraderie can play such a big part. A kind word, just dropping back to ‘give a wheel’, or handing over your last energy bar, or even stopping in a café for a coffee or ice-cream can change everything. We might have a car near them with a cool drink of coke, a gel and a smile, but it’s usually thanks to one’s co-riders that things get better! For some riders though, it does eventually get too much and so yes, some quit the challenge (very few over the years). Usually riders take a day in a support vehicle, where they sleep a LOT, and then feel ready to ride again the next day with a smile. At 61 you are an amazing athlete yourself. After 10 years what motivates you to keep riding with the challengers at every event? I’m a lucky person, I give thanks for that daily. Not only for my physical form, bur for the passion that comes from somewhere within me. Of course, I love riding my bike, but I could do that in the beautiful Ardennes region of Belgium, where I live. It’s my passion to take riders to new places, both physical and mental, that give me my “CCC Mojo!” I am still as excited as a child to see the sun rise from behind a mountain, knowing the places we are going to be riding on that new day. Then to see the faces of my clients, at the end of a hard day’s ride, beaming with the moments they have just lived through, having survived the doubt-ditches, is something that words can’t explain. I receive words of thanks after the event (having told me how much they hated me, on the event!) that tell of how they can see their lives from a new perspective and THAT is where I get my fuel from for another year of CCC. It’s not all about the bike! But that would need a book to explain!! People often refer to the Cent Cols events as life-changing, what is it about the Cent Cols Challenge that makes people feel that? If you’d like to ride the Cent Cols Challenge, head to centcolschallenge.com to find out more. Big thanks to Albion for some of the original interview questions. Phil's photo is by Jered Gruber.